God bless our veterans! Happy Veteran's Day! 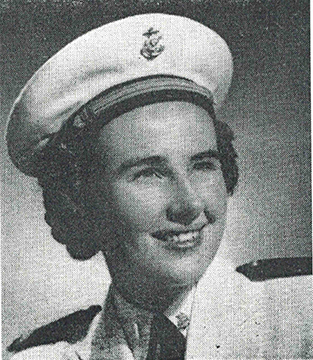 Happy Veteran’s Day to our country’s veterans – and to our own Sister Terence Glum, a Navy nurse during World War II. After graduating from St. Mary’s High School in Bismarck, Sister Terence pursued a career in nursing, receiving her training at St. Alexius Hospital. She graduated in 1942, the year World War II began. When each of her four brothers were drafted into the service after the bombing of Pearl Harbor, Sister Terence made the decision to join the Navy Nurse Corps, utilizing her training as a nurse to support the nation’s war effort. Sister Terence began her military nursing career at the Great Lakes Naval Base, outside of Chicago. From there she was stationed in Bethesda, Maryland. At Bethesda, Navy nurses were assigned 40-60 patients per nurse. During this time, there was a polio epidemic. Sister Terence also worked at the children’s hospital in Bethesda because there was such a need for nurses. She recalls that an entire ward of the children’s hospital was full of children who were stricken with polio, in iron lungs. After the war was over, she made another important life decision: to enter religious life as a Benedictine Sister of Annunciation Monastery. Sister Terence has enjoyed ministries in both nursing and teaching. She has served as a nurse at St. Alexius Hospital as well as at Garrison Memorial Hospital, and has received education and training in anesthesia. Additionally, she has obtained her masters’ degree in science education, and taught at the University of Mary for 25 years. “I liked teaching very much,” she reminisces. Currently, Sister Terence serves in a supportive capacity for the monastery, and is involved in a variety of tasks, including switchboard/receptionist and management of mail receipt and delivery. As both hobby and ministry, she knits and crochets a variety of lovely articles of clothing and accessories which are sent to missions who serve the poor. May God bless you as you bless so many others, Sister Terence!